If you train the sprints, a lot of your workouts will be “on the fly” where you have a 10 meter lead-in run (i.e. running start). This removes the “acceleration” component in your timing. For example, a “Fly 150” is usually a 160m run and time the last 150m. Your Fly 150s is a great extrapolation tool to determine your 200m and 400m fitness. If you time a 30m or 40 yard dash, then you know the hands move a fraction of a second before your legs. Thus, the TX Touch Transmitter will accurately time your run when you start (excluding reaction time). 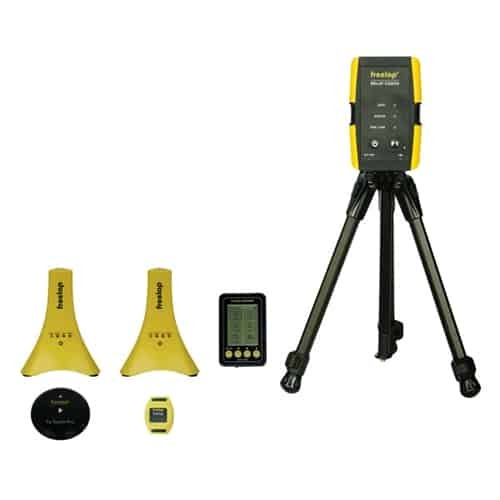 This Freelap TX Touch transmitter is designed for block starts and three-point football starts. The athlete places a thumb on the transmitter, and as the thumb comes off the transmitter, the watch is triggered. The TX Touch has a non-replaceable lithium battery that is rated for 15,000 starts. The accuracy is 1/100 seconds. The TX Touch has a solid construction and is water resistant. The Freelap Pro Coach Electronic Timing System is wireless, accurate, easy to set up and use, versatile, expandable, compact, and portable. The Freelap Pro Coach 112 Timing System includes Pro Coach handheld receiver, Relay Coach with Tripod, (1) FxChip, (1) Tx Touch Pro Transmitter, (2) Tx Junior Pro Transmitters, and Pro Coach Canvas Case. 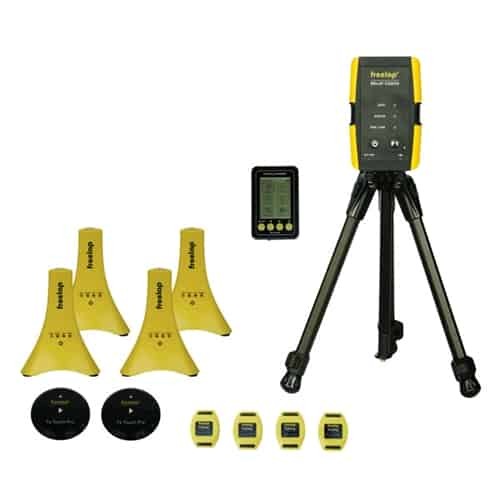 The Freelap Pro Coach 424 Timing System includes Pro Coach handheld receiver, Relay Coach with Tripod, (4) FxChips, (2) Tx Touch Pro Transmitters, (4) Tx Junior Pro Transmitters, and Pro Coach Canvas Case. Time multiple athletes simultaneously in a wide range of training scenarios including block starts, 10 and 40 yard dash, flying sprints, splits, hurdles, tempo runs, laps, and the velocity of horizontal jumpers. The Freelap TX Junior Transmitter is a portable battery-powered device that triggers Freelap Stopwatch. A single TX Junior can be used to time laps, or a single TX Junior can be used in combination with the TX Touch, or a pair of TX Juniors can be used to time short sprints. USA Purchases: Shipping is a flat rate $19.95 using FedEx Home Delivery. International Purchases: We can ship to any country EXCEPT Australia, Austria, Brazil, Canada, Czech Republic, Estonia, Finland, France, Germany, Greece, Italy, Netherlands, New Zealand, Poland, Switzerland, United Kingdom, as these countries have their own distributors. Shipping is a flat rate $39.95. 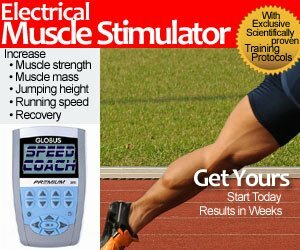 Contact us at orders (at) speedendurance.com for shipping information.